NEW YORK (Reuters) - Oil gained on Friday while stocks on Wall Street closed lower even as major U.S. and European stock indices posted their best month in at least four years, boosted in part by accommodative monetary policies in the euro zone and Japan. Oil prices rose after the U.S. oil rig count fell for a ninth straight week, indicating potentially lower crude output in coming months in the face of a global supply glut. The dollar slipped after data showing U.S. consumer spending in September recorded its smallest gain in eight months as personal income barely rose, suggesting some cooling in domestic demand after recent hefty increases. European shares closed slightly higher, with the pan-European FTSEurofirst 300 index (.FTEU3) up 0.01 percent at 1,484.46, while the euro zone's blue-chip Euro STOXX 50 index <.STOXX50E> rose 0.14 percent to 3,418.23. The two indices posted their best monthly gains in more than six years. MSCI's all-country world index <.MIWD00000PUS> of stock performance in 46 countries retreated at the close, falling 0.11 percent. But the indice posted its best monthly gain since October 2011, the same as the three major U.S. indices. All four indices posted gains of 7.7 percent or more in October. 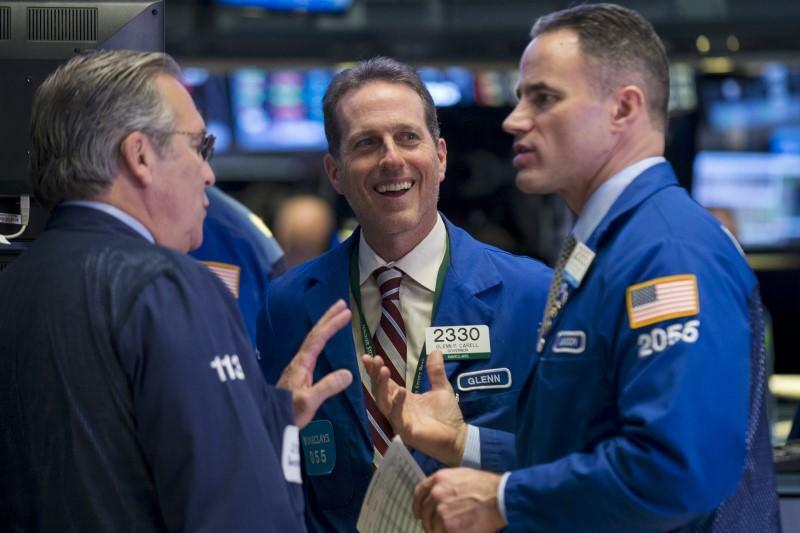 Financial stocks led the decline on Wall Street as falling prices accelerated at the close. Traders had focused on heavy sell orders posted for the close, said Ken Polcari, director of the NYSE floor division at O'Neil Securities in New York. The Dow Jones industrial average (.DJI) closed down 92.26 points, or 0.52 percent, to 17,663.54. The S&P 500 (.SPX) fell 10.05 points, or 0.48 percent, to 2,079.36 and the Nasdaq Composite (.IXIC) lost 20.53 points, or 0.4 percent, to 5,053.75. "The burning question on everybody's lips is very simply, what is going to happen at the end of the year, are we going to get the Santa Claus rally?" said Andrew Wilkinson, chief market strategist at Interactive Brokers LLC in Greenwich, Connecticut. Investors have taken in stride indications that the U.S. Federal Reserve will raise interest rates in December, and worries about slowing Chinese growth have subsided, he said. "There are no barbarians at the gate at this moment. Everything seems to have calmed, volatility has come down, people seem to comprehend what the Fed is about to do and they got a greater sense of how deep the Chinese problems are," he said. The CBOE Volatility index (.VIX) fell 38.5 percent in October, its biggest monthly drop on record. Energy majors Exxon (XOM.N) and Chevron (CVX.N) reported better-than-expected results, helped by strong refining margins. Exxon rose 0.6 percent to $82.74 and Chevron was up 1.1 percent to $90.88. Chevron was the biggest boost to the Dow, and Exxon was the third-largest. U.S. Treasuries prices rose, with benchmark yields retreating from one-month peaks as soft domestic and overseas data renewed traders' focus on tepid global growth. Month-end buying boosted longer-dated Treasuries prices. Some investors added U.S. bonds back to their holdings on expectations of further bond-buying stimulus from the European Central Bank and the Bank of Japan to combat deflation. The dollar index (.DXY=), a measure of the greenback against six major currencies, fell 0.31 percent to 96.980. The greenback fell as low as 120.29 yen after the Bank of Japan announcement, before reversing course. The dollar last traded down 0.39 percent at 120.69 yen. The euro (EUR=) broke the $1.10 mark against the dollar, rising as high as $1.1072, supported by an unexpected improvement in euro zone economic sentiment and signs of faster-than-expected inflation in Germany. It was last up 0.16 percent at $1.0994. U.S. benchmark 10-year Treasury notes rose 7/32 in price to yield 2.1457 percent. Brent, the global benchmark for oil, settled 76 cents higher at $49.56 a barrel. U.S. crude futures (CLc1) rose 53 cents to settle at $46.59 a barrel.